Elephants are disappearing from the planet at an alarming rate, an existential crisis driven mainly by poachers after their tusks. And what is the best way to curtail poaching? Shutting down ivory markets, of course. Okay, so international sales -- from one country to another -- are banned. But wait, there are four nations that allow *domestic* sales of ivory? And one of them is ... Canada? That's right, the world's most polite country is behaving quite badly when it comes to legally allowing ivory sales. As the NGO Elephanatics (one of Moving Giants "Elephant Champions") points out, "Did you know it is still legal to buy and sell ivory in Canada?" Elephanatics is an elephant advocacy organization out of Vancouver in Canada, and their mission "is to assist global elephant conservation efforts by educating Canadians about issues of ivory poaching, habitat loss, and the continued exploitation of elephants by humans," and they try to "connect Canadians directly with elephant conservation partners in Africa and Asia." Their signature effort, of sorts, is trying to reverse the stand of the Canadian government on ivory. They launched a petition in 2017 to back that position, and sent a letter to the Minister of Environment and Climate Change, Catherine McKenna. After hoping to get just 1,000 signatures, the effort eventually went viral. When the Toronto Star wrote about the effort in March this year, the petition had accumulated 125,000 names. As of today, the petition has climbed to 212,000 backers, well on its way to a quarter-million backers. If you want to support the effort, you can add your name here. 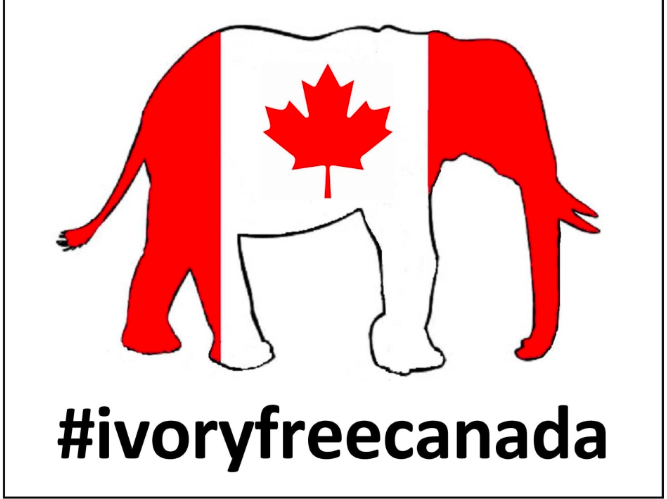 You can also use the hashtag #ivoryfreecanada and take a selfie holding the IFC poster, available here.